Brought up and educated in Nigeria, Margaret Ogunbanwo set up her business, Maggie’s Exotic Foods, in an attempt to recreate some of the culinary delights that she was brought up with. 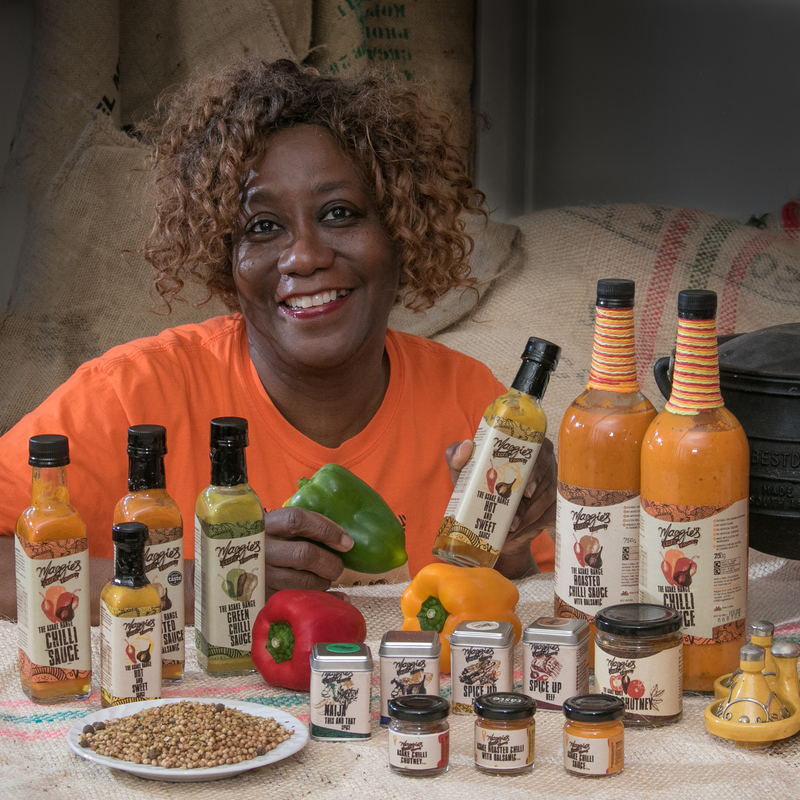 The business was inspired by Maggie’s passion for her African heritage, love for food, cooking and seeing young people, especially women, grow to their full potential. Maggie’s Exotic Foods was established in 1997 and offers a range of authentic homemade products, exotic ingredients, including spice mixes, sauces and pastes, and provides catering services, cookery demonstrations and classes. The business also supplies vegan, vegetarian, dairy-free and gluten-free ingredients, and offers gift packs, enabling customers to make their own exotic food mixes. Maggie’s business history began in the late 90’s in Essex where she applied to The Prince’s Trust to get her fledgling catering and exotic food supply business off to a start. Having impressed the judges, she found she was pregnant with her first child and as a result of related health challenges, she put her business development on hold. Maggie began her Welsh business adventure after moving with her family to a small village called Penygroes in Gwynedd in 2007. She started offering cooked African food at her local farmers’ markets and was inspired to open a local café in her home. Launched thanks to advisory and financial support from Business Wales, this was her first major venture in Wales. While cooked sausages, eggs and mushroom sales declined, Maggie’s African Evenings pop-up restaurant was gaining popularity, showcasing the variety and versatility of African cooking using mostly locally sourced ingredients. As a result of these evenings, she started Maggie’s Exotic Foods, where she developed her Asake range of table ready sauces and chutneys, and has just launched ‘Ileripromise Hair Custard’, a specialist hair conditioner. As well as an SFD Excellence award, in 2017 Maggie’s Exotic Foods also won a Great Taste Award for the Asake Roasted Chilli with Balsamic sauce. When the family moved to Gwynedd, they realised it was important to engage with the local language and people. Margaret immersed herself into learning the language on a part-time basis. Her Welsh was boosted by running The Melting Pot (Y Grochan Flasus) café in the 80% -Welsh-speaking Penygroes where she utilised the language daily. More recently, she has found it increasingly useful when attending food festivals and similar events across Wales. Margaret has worked closely with Business Wales throughout her business journey. She was originally supported by a Relationship Manager, Richard Fraser-Williams, who helped her access a grant for her café, and more recently by a Growth Adviser, Jayne Jones, who signposted Maggie to advice, opportunities, trade missions, workshops on merchandising, sales strategies and most importantly, gave her the confidence boost and encouragement she needed to succeed. Jayne also walked Maggie through the development, launch and marketing of the Asake range of sauces, helping her approach the Mayor, who helped her bring the attention of the local community to the new product range. Maggie then went on to receive support from a Business Wales mentor Janet Matthews, who shared her wealth of knowledge, experience with people, time and resources. Janet provided direction and support to reverse a downward trend in the business, making Maggie consider capacity building and potential growth, which allowed her to take on new contracts. With her uplifting and inspiring attitude, Janet was also able to successfully bridge cultural background differences thanks to her in-depth understanding and communication skills, helping Maggie see herself as others see her, ultimately building her confidence to move forward and succeed. Maggie has now become a Business Wales mentor herself and is hosting her own Business Wales business support events at her premises. Maggie commented: “My Business Wales advisers have helped me considerably, always willing and available to help my business grow. More recently, I was introduced to the fabulous mentoring scheme, run by Business Wales. Not only did I find a mentor in Janet Matthews, but have signed up to be a business mentor myself. Janet has the knowledge of working in the UK in a self-employed capacity spanning many years and can plug gaps in my knowledge as a business person in the UK.